To get a good northern lights forecast you can use data from eg. NASA and the Swedish Institute for Space Physics. The auroras have been speculated over and studied in great detail here in Lapland, with over a hundred years of expeditions, instrument development and international cooperation. Today, a network of scientific instruments in space and here on Earth provide round-the-clock information about the when, where and how intense of our alluring Aurora Borealis. Here we wish to guide you through some of this information so you can predict your own aurora experience and have a greater understanding of what is actually going on up there. The data comes from the magnetometers based in Kiruna at the Swedish Institute of Space Physics. Click on the link and you will see data in a Kiruna Eda Magnetogram for today’s date. This is a record of the amount of activity in the portion of the magnetosphere around Kiruna. When high-energy particles travel into the atmosphere along the magnetic field lines, the activity rises, thus resulting in aurora. So, a rise, or peaks, in the magnetogram means there is something going on in the atmosphere in the region around Kiruna! This image below is produced using the most recent data collected by the NOAA POES satellite. The satellite collects data on energy levels in the atmosphere. It provides an estimate of the location, extent and intensity of aurora on a global basis and can be good to use for a good northern lights forecast. It is updated every 10 minutes, giving you a guide to the possibility of seeing aurora at a given location at the time of the most recent satellite pass. The greater the power flux recorded by the satellite (0 to 10 erg/cm2/s), the redder the auroral oval, and thus the greater the likelihood of seeing aurora. Worth noting is the n-factor, to the left of the image, which tells you how accurate the image is. This is based on the satellite performance at the time, i.e. the amount of data collected. The lower the value, preferably far below 2.0, the more accurate the image. The red arrow points to the noon meridian. Wait for the update and see how the oval shifts! How do you then use these to hunt for the aurora? 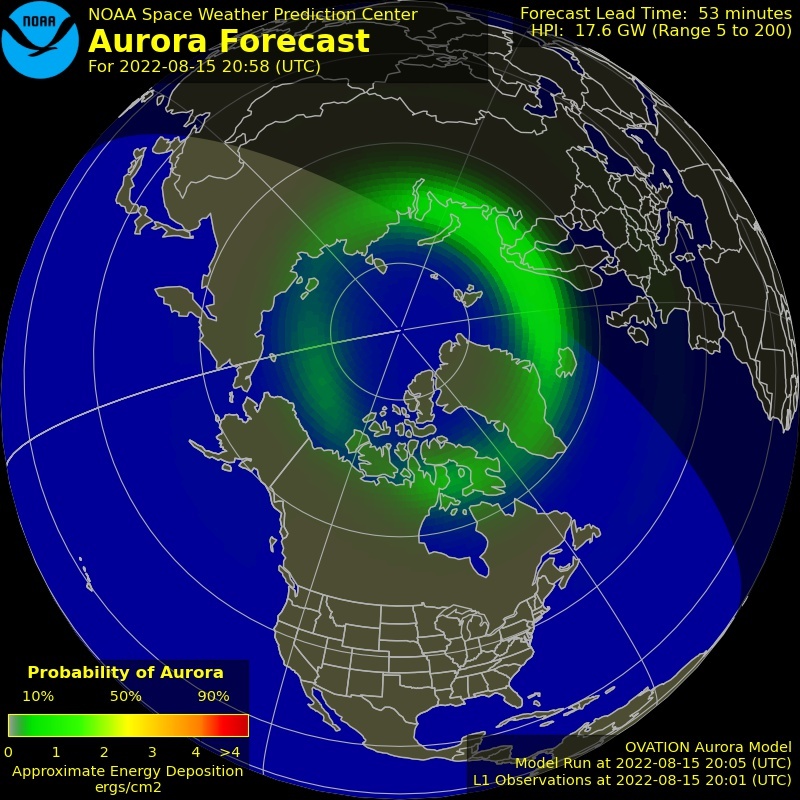 First, check out the latest position of the auroral oval, and the quality of the data (n-factor). Next, how much activity is there? How “red” is the oval? After that, look at the raw data from Kiruna. Is there anything being recorded by the instruments here? And when everything says there is a show on the way – get out to see the it live! If the local K-index is 2 or higher in Kiruna or Abisko you do have a good northern lights forecast and good chance for a great show. If you are on lower latitude you will need a higher index to see the Aurora in a good way. Hopefully your prediction has set you centre stage and just in time for a beautiful performance.